Rand Hall is being transformed over the next 18 months to house the Mui Ho Fine Arts Library, a state-of-the-art facility on its top two floors with massed stacks of books as its centerpiece, digital resources, and voluminous reading and study space. Along with 8,000 square feet of shop space for the College of Architecture, Art and Planning (AAP) occupying the first floor, the 107-year-old industrial building is being entirely rehabilitated. 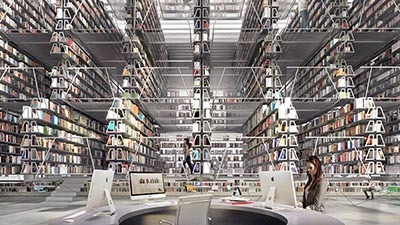 Boasting one of the best circulating collections of fine arts materials in the country, the library will accommodate 125,000 volumes, in a configuration forming an inverted ziggurat of books two stories high with stacks accessible by stairs and walkways. The library’s primary users also include Herbert F. Johnson Museum of Art staff, and students and faculty in landscape architecture, fine art, city and regional planning, interior design and the history of art and visual studies. The renovated Rand Hall will visibly display two essential activities of the AAP community, said Kent Kleinman, the college’s Gale and Ira Drukier Dean. Other features will include reading carrels with built-in monitors and lockable book storage, public computing stations and a seminar room, and Kleinman foresees having a large touch screen so users can call up digital materials. All within a few yards of the architecture studios in adjoining Milstein Hall. Mui Ho ’62, B.Arch. ’66, an architect and educator retired from the University of California, Berkeley, committed $6 million to the library in 2013. The $21.6 million project received its final approval from the Cornell University Board of Trustees Dec. 7, and contractors from Welliver began interior demolition work in Rand Hall Dec. 19. Construction is expected to be completed in June 2019 and the library will open for the subsequent fall semester. Wolfgang Tschapeller, M.Arch. ’87, is the design architect, and New York City-based STV is the architectural firm of record, with a team led by Harris Feinn, B.Arch. ’69, M.Arch. ’71. About half of the on-site fine arts collection previously available in Sibley Dome and the east wing of Sibley Hall was moved to the third floor of Rand Hall when Milstein Hall was completed in 2011. “Milstein had an impact on circulation patterns and the organization of the college, and this is the final step in that reorganization,” Kleinman said. During the construction, Fine Arts Library services are located in B56 East Sibley, with library staff, reference books, journals and reserve books on-site. Other holdings can be called in from the library annex. The building will realize significant energy savings from the project with upgrades including rigid foam insulation, installing double-glazed windows all around and replacing all mechanical systems, with a projected target of cutting 70 percent of Rand Hall’s existing energy use, Kleinman said. In the run-up to the project, AAP students used empty spaces in Rand for a variety of creative projects and performances. Similar opportunities will exist with the next iteration of the building. One new feature will be a 1,500-square-foot structural deck on Rand Hall’s roof, outfitted with base plates for temporary structures as well as power, water and digital connections. As a visiting critic in the early 1950s, futurist and inventor R. Buckminster Fuller worked with Cornell students to build a geodesic dome atop Rand Hall. A version of this story first appeared in the Cornell Chronicle.